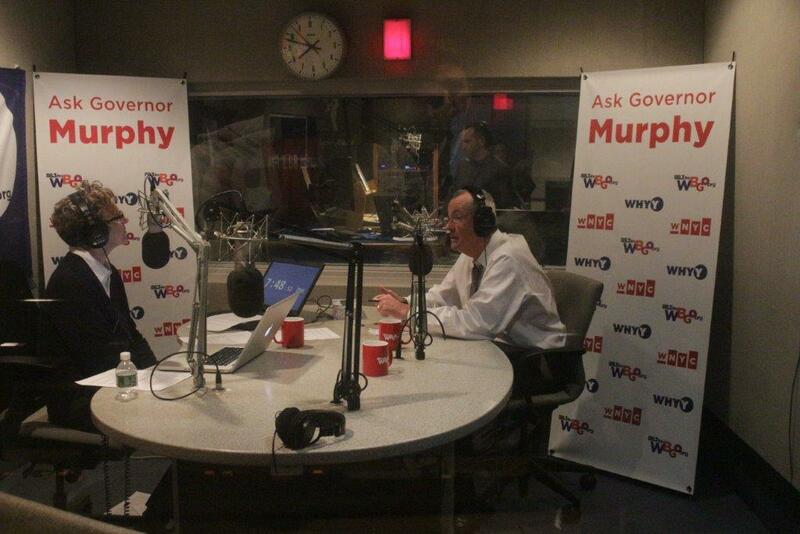 Live call-in show with New Jersey Governor Phil Murphy hosted by WNYC's Nancy Solomon. New Jersey Governor Phil Murphy with Ask Governor Murphy host WNYC's Nancy Solomon at WBGO studios in downtown Newark. New Jersey Governor Phil Murphy makes his Ask Governor Murphy debut. The one-hour call-in show is produced by WBGO News, in collaboration with WHYY and WNYC. The governor and host Nancy Solomon of WNYC, discuss everything from medical marijuana, to taxes climate change, and gun violence in schools. Governor Murphy is also joined by special guest Matt Arco, Statehouse reporter for NJ Advance Media. Former Goldman Sachs executive Phil Murphy has won the Democratic nomination in the race to succeed New Jersey Governor Chris Christie. In his victory speech, Murphy says people all across New Jersey are demanding change and he’s here to change things. Murphy says he’d fully fund education and put the state on the path to making full payments into the public employee pension fund. And he has a way to pay for it. Democrat Phil Murphy will be the next governor of New Jersey, after defeating Republican Kim Guadagno in the race to replace Chris Christie. In his victory speech, Murphy told his supporters says the days of division are over and as New Jersey’s next governor he’ll work to rebuild the state. Murphy says his first task will be living up to his campaign promise to build a stronger and fairer economy. Do you have a question for New Jersey's Governor? WBGO News, in collaboration with WHYY and WNYC, will present Ask Governor Murphy, a one-hour call-in show with New Jersey Governor Phil Murphy. Our first show airs Thursday, March 22 at 7 p.m. The show will be broadcast on WBGO and hosted by WNYC’s Nancy Solomon. Submit your question in advance at AskGovMurphy.org, or tweet us with the hashtag #askgovmurphy. The call-in number for Ask Governor Murphy is 844-677-9283. Political analysts believe it's likely Democratic gubernatorial nominee Phil Murphy's proposed tax increases will be approved if he's elected and Democrats maintain control of the New Jersey legislature. Nearly half of the $1.3 billion Murphy's tax hikes are expected to raise would come from a millionaires' tax. Governor Christie has vetoed five attempts by Democrats to impose that levy. Rider University political science professor Ben Dworkin believes Democrats will get it done if Murphy becomes governor. New Jersey Governor Phil Murphy will unveil his first state budget plan in a speech to a joint session of the legislature tomorrow. Republican lawmakers are urging Murphy to reverse his campaign promise and not propose a tax surcharge on millionaires. Senate Minority Leader Tom Kean says increasing taxes would send a bad message to individuals and corporations.